This collection consists of the records of Christine Macy from her time in the First Lady’s Office. Macy was Senior Speechwriter for First Lady Hillary Rodham Clinton from January 1998 to September 1999. 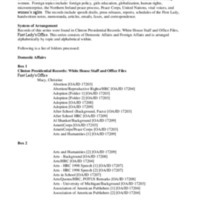 This series contains draft and final copies of speeches delivered by First Lady Hillary Rodham Clinton on domestic and foreign issues. This series also contains background material used by Christine Macy to write the First Lady’s speeches. Domestic topics include: adoption, the arts, after school programs, breast cancer, children’s health care, colon cancer, domestic violence, education, the millennium, race, Save America’s Treasures tour, school modernization, school safety, school violence, and working women. Foreign topics include: foreign policy, girls education, globalization, human rights, microenterprise, the Northern Ireland peace process, peace corps, United Nations, vital voices, and women’s rights.